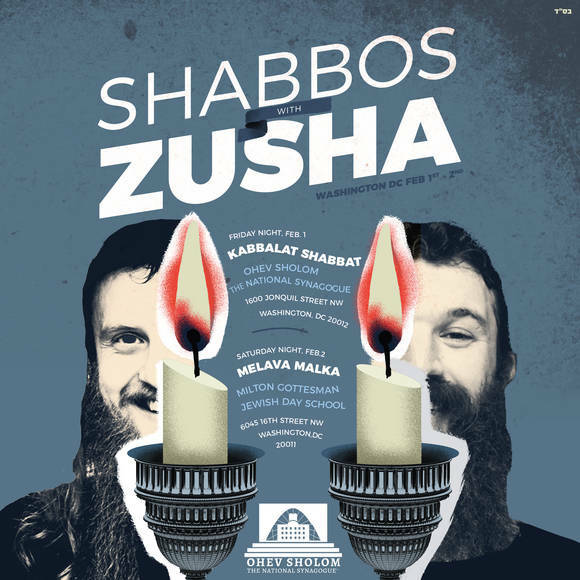 4:50p Mincha, followed by Seudah Shlishit with a Shiur from Jorian Polis Schutz on "Borders and No Borders: Brickwork and God's Feet in Mishpatim"
This Shabbat, we are excited to welcome Zusha! This weekend was made possible by our generous sponsors, listed below. A very special thanks goes to David Gillers, Harris Cohen, Chaim Fruchter, Miri Ploff, Sindy Udell, Lindsey Marks, and Amanda Reich for all of their hard work organizing and planning the weekend’s events. This week's Kiddush & Dessert are sponsored by the congregation in honor of Anna Yuter's 106th Birthday. Happy birthday, Anna! Thank you to all those who made contributions in Anna's honor. We are saddened to announce the passing of Enio Molina, who served on our maintenance staff from 2010-2015. CESJDS Shabbaton February 9th: Next Shabbat, we will welcome Dr. Eliana Lispky, Middle School Principal of Charles E. Smith Jewish Day School. Dr. Lipsky will have a Q&A after Kiddush for those who would like to learn more about CESJDS, and she will speak at Seudah Shlishit on "Empathy’s Role in Education: Lessons from Torah and Educational Research." Shabbat with Kulanu February 16th: Bonita Nathan Sussman, Vice President of Kulanu, will give the morning Dvar Torah on “Kulanu: Addressing the Needs of Emerging Jewish Communities around the Globe.” That evening, all are invited to a reception at Ohev Sholom with members of Kulanu's board to learn more about Kulanu and celebrate the organization's 25th anniversary (8:00pm-10:00pm). Yad Yehuda's Capital Kosher Pantry needs donations of kosher food items to fill its shelves. To make it simple to donate, their staff have set up online "Wish Lists" which are regularly updated to reflect the pantry's current needs. Items are shipped directly to the Capital Kosher Pantry, usually with no shipping fee. Feel free to take advantage of any online sales you may find on relevant pantry items, but please verify that they have reliable kosher supervision. For links to the Pantry Wish Lists, please visit yadyehuda.org/pantry-wishlist. Melava Malka is free of charge thanks to our generous sponsors. However, RSVP is requested. The Parsha this Shabbos is Mishpatim, "Laws." It opens with God telling Moshe, "These are the laws that you shall put before them" ("asher tasim lifneihem"). From these words, the rabbis learn that a rabbi is obligated to present his teachings to his students "k'shulchan aruch," like a "set table," so they can be easily understood. The term "Shulchan Aruch" was adopted by Rabbi Joseph Caro as the name for his comprehensive 16th Century "Code of Jewish Law." The term has become synonymous with the entire body of Jewish law, "What does the Shulchan Aruch say?" means "What are the requirements of Jewish law?" The Parsha includes a myriad of laws: religious, civil, criminal, and much else. While some of these laws may be of marginal relevance today, others are of direct and critical application at present. "Do not wrong or oppress the stranger." (22:20). Rashi makes it clear that a stranger is a person from another country who comes to live with you -- in our terminology, an "immigrant." The Torah immediately gives a rationale for the law: "…for you were strangers in the land of Egypt." The rabbis elicit from this the general principle: "a deficiency that you have, do not attribute to your neighbor." In that spirit, signs currently on display in front of a number of synagogues declare: "We were immigrants once." The basic law of Kashrus is also included: "Flesh that is 'trefa,' that is killed in the wild and not ritually slaughtered, may not be eaten but must be 'thrown to the dogs.’” The Torah awards nonkosher meat to dogs, because, as Moshe stated to Pharaoh, no dog snarled ("yecheratz leshono") at the Israelites during the plague of the first born. It should be noted that, in Hebrew, the word for "law" and the word for "judge" and the word for "justice" all have the same root ("shafot"). There can be no law that is not just; and there can be no judge who does not apply just laws. The Haftorah is from Jeremiah who once again chastises the people of Israel for their sinfulness. Jeremiah says, poetically, that God will give "liberty" to the "sword, pestilence, and famine" to punish the Jews for their sins (34:17). The Hebrew word used for 'liberty" is "dror." In the Torah the word "dror" appears among the laws of the Jubilee year (yovel). "And you shall proclaim liberty (dror) throughout the land and to the inhabitants thereof." These words are famously inscribed on the Liberty Bell, celebrating our American freedom. 5:00p Mincha, followed by Seudah Shlishit with a Shiur from Dr. Eliana Lispky on "Empathy’s Role in Education: Lessons from Torah and Educational Research"